Tripp Lite's 10-meter multimode duplex Fibre Channel optic LC/LC patch cable is manufactured from 50/125 zipcord fiber. 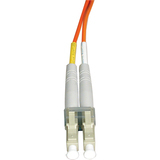 The cable has LC connectors on each end. It has a PVC jacket and is FDDI and OFNR rated. 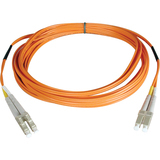 50/125 Duplex multimode fiber is most commonly used in Fibre Channel applications. 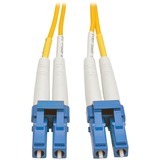 It is backward compatible with 62.5 micron fiber and provides built-in headroom for future applications. The cable provides higher bandwidth optimized for Gigabit and 10Gbps networks as well. 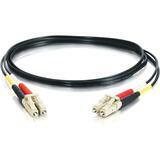 Also available in 1, 2, 3, 5, 15, 20, 25, 30, and 50 meter lengths. Enter "N520-" in the search field to bring up all lengths. 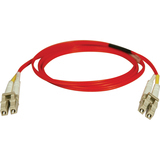 For LC-SC cables, search "N516-", and for SC-SC, search "N506-". Tripp Lite warrants this product to be free from defects in materials and workmanship for life.